Yes and no. While some people are worried about actually getting bit by Carpenter ants, the bigger concern is them biting into your NJ or PA home. Carpenter ants have large jaws that are strong enough to bite through wood, so, needless to say, they are capable of biting into your skin as well. However, they are not looking to bite humans or animals unless they feel threatened. The initial bite can be rather painful and is followed by localized irritation similar to a bee sting. Despite the fact that they hurt, carpenter ants rarely bite, and the bites are essentially harmless, as carpenter ants don’t spread disease. Carpenter ants can cause damage to wood structures (usually wood that has been moistened and is damp or weakened by decay). Since they tend to keep coming back year after year, they can also be difficult to control on your own. Seal potential entry points into your home (cracks, crevices, points where utility lines enter etc.). Trim shrubs and tree branches so they don’t touch your home. Replace decayed or damaged wood and repair leaks and any other condition that causing moisture or decay. For residents with an active Carpenter Ant infestation at home, the Cooper Carpenter Ant System™ focuses on eliminating active ant colonies. Detailed inspections are performed to locate Carpenter Ant trails, and with pinpoint accuracy our pest management professionals deliver the system, which includes both a bait and liquid treatment to the exterior of the home. The ants feed on the bait and contact the residual treatment, taking both materials back to the colony where they are transferred to other ants, thus destroying the colony. The program is available only through Cooper Pest Solutions. 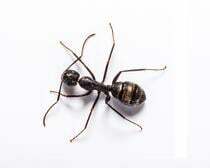 Click here to learn more about our Carpenter Ant Service. Ready to start protecting your home against carpenter ants? Scheduled service online today for fast technician dispatch.